I have done that trip many times. I believe the key is to remember you are sailing in the north Atlantic and although you may be less that a hundred miles offshore you are "at sea". Most trips at that time of year are non-events, outside of damp chilly air and an occasional 25 -30 kt. day. It is important to have your coastal navigation down pat,electronics being used as a backup to your chartwork. Keep a sharp lookout, plenty of fishing boats about and other commercial traffic. Stay warm, once the chills set in your misery level can be significant. P.S. The fog is worst here when the winds are from the East or South East not the Sou' West which are the prevailing winds. 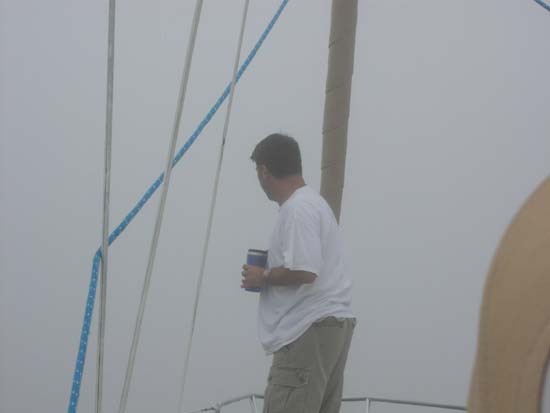 It does get foggy in Sou' Westers but it's MUCH more likely with an East or South East wind... Oh and it does get thick 30 to 80 feet of vis is not that uncommon in certain areas..
That's why you have to carry a big bag of Maine Potaoes aboard. When the fog gets thick you just chuck em in the direction of shore. If it splashes you know you are okay, if you hear a dull thud..probably not good.